Most giraffes we see in movies and cartoons are often portrayed as gentle creatures, which they are in real life anyways. Enter the Gentle Giraffe as a gift idea for your little one this Christmas, allowing him/her to feel comforted and soothed by safari sounds without having to purchase a flight ticket to Africa. On the outside, he’s a plush little chap who’s huggable and cute. On the inside, he’s an audio extravaganza. 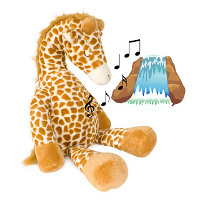 For contained within Gentle Giraffe’s body is a small, removable audio player that can play back four different sounds of the natural world, each with the ability to stimulate your child’s mind. There are four sound options to choose from. Each of the four sound options is a singular experience. There’s Play, where Gentle Giraffe sings along to the rhythm of native tribal music like Paul Simon with a long neck; or Relax, where he takes you on a fun journey through the Serengeti plains. The next audio setting is Calm, where the soothing sounds of a gentle African stream trickling through rocks drifts your child into a relaxing frame of mind. The last is Sleep, a soundtrack designed to help anyone big or small drop off to the land of nod by broadcasting the mellow susurration of a waterfall. The speaker and buttons can be found in the giraffe’s back. The Gentle Giraffe is going for £29.99 a pop, and to make sure that no batteries are wasted in the process, you can always set the timer function to turn it off after 23 or 45 minutes (don’t ask me why it is 23 minutes and not something that’s rounded up to the nearest 5 minutes…).